Kylie and Scott got married at Trinity Tree Farm this past summer. They were having a travel themed wedding, so we were able to incorporate some really cool and unique signage into their day. They included a directional sign with mileage from Trintiy Tree Farm to important place to them. They also had one of the most unique seating charts I've done to date. Each table was a different country with the country name painted on small wooden blocks. They wanted the seating chart to be displayed like a world map. I sketched out some continents then laid out the names as closely to their destination as possible, with some cute airplanes doodles throughout the map. We had some bar signage, chair signage, hashtag and guestbook signage. A welcome sign that got finished off with some gorgeous florals. A SMORE's sign that was done via inverted stencil. We finished everything off with some torn edges menus that were tucked into each napkin and folded table tent place cards. The day looks like it came together beautifully, I know a huge team of vendors came together for this one. I have to thank Brittny for her coordination at Trinity Tree Farm, as well as Benj Haisch for his beautiful photography and attention to detail. and of course, biggest thanks to Kylie and Scott for letting me be a part of their day and sharing these images! A beautiful couple, a stunning wedding day! Another real wedding coming at you today! This ones got me dreaming of sandy beaches and sunshine. 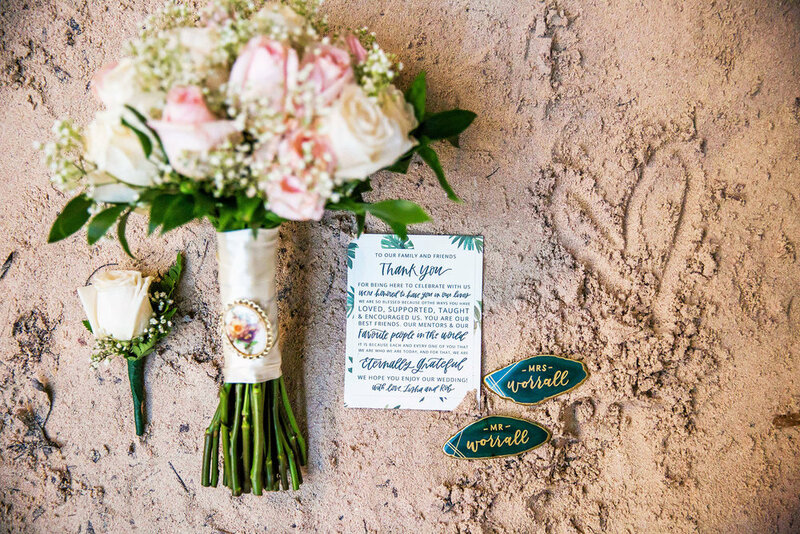 These are the types of weddings that made me really wish bringing your stationary designer to your wedding was normal wedding protocol- seriously looks like a dreamy location to catch some rays and dip your toes in the water! Working with Lisha on her wedding day goods was a lot of fun for me. Lisha was an incredibly easy bride to work with, she knew what she wanted but also left me with a lot of creative freedom. 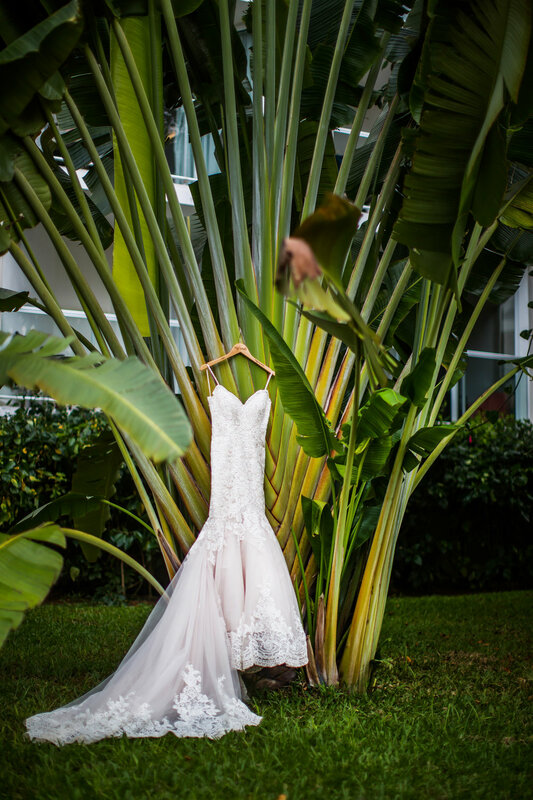 She knew she wanted to incorporate some of the island's natural greenery into her suite, she loved watercolor and she had a blush and green beachy theme going on. She also knew she didn't want anything too formal to reflect her wedding style. We started with her wedding invitations. They featured a bold and fun hand-lettered design of their names, and a few accent words. They were printed in a light blush ink onto some thick cardstock and the back featured some watercolor Jamaican greenery. Once these were printed, I went in and individually brushed a thick coating of gold paint strokes to the bottom of each invitation. These were a labor of love, but also a lot of fun to do. Once we got the invitations out, we moved onto Day of Goods. For Day of Goods, the earlier you can get these details ironed out, the better. Wedding Welcome Packets: Lisha opted for folded programs for little welcome cards for her guests. They featured similar lettering style to her invitations, with information for guests about the weekend schedule. 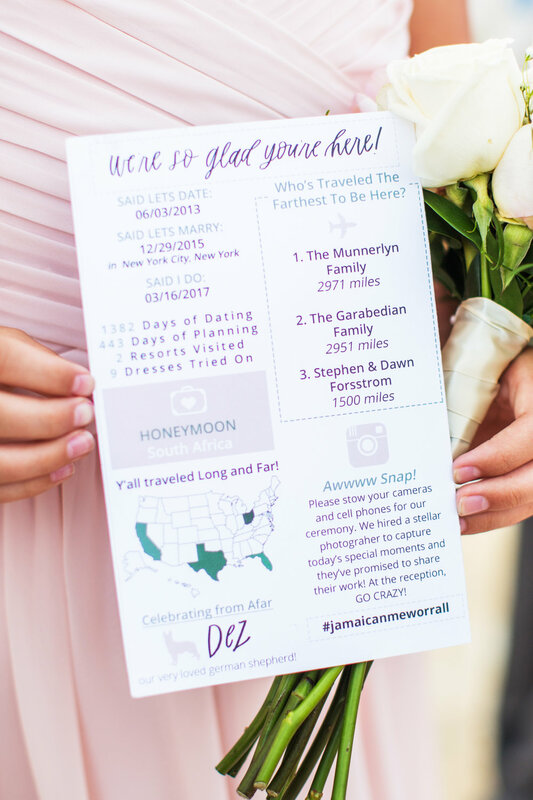 Wedding Programs: Being in Jamaica, Lisha wanted these to be fun and functional. She opted for fan programs. For these we printed them on folded cardstock and glued a giant popsicle stick into each program. The front of them had information about the ceremony itself, the back was full of fun facts about their wedding which is fun for guests as they sit and wait for the ceremony to begin. Dinner Items: We did a menu that had an ombre green watercolor along the back with white writing on top of it. These were paired with coordinating place cards that I wrote each name in masking fluid then watercolored over the name and once that dried, I erased the masking fluid to give it a really cool look. She also had some sweet little thank you notes designed that were then tucked into her napkins. This is important! Especially for destination weddings where your friends and family have invested in traveling to your wedding day, a special little note thanking them for being there goes a long way. Signage: Lisha opted for wood signage. We had a small seating chart with names listed under tables. 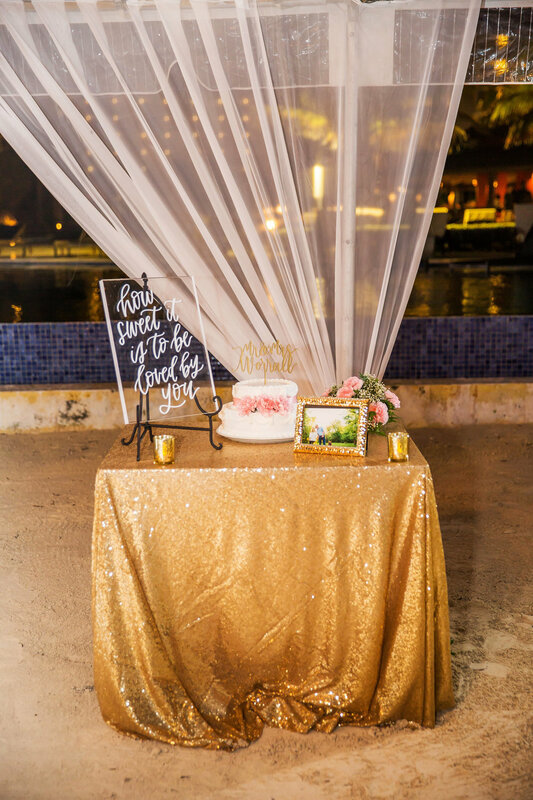 We also had a welcome sign with some gold leafy designs to coordinate with other gold accents at her wedding. Additionally, her welcome table had a hashtag sign so guests knew how to share any photos taken. We also did a some acrylic signage which I'm a HUGE fan of. 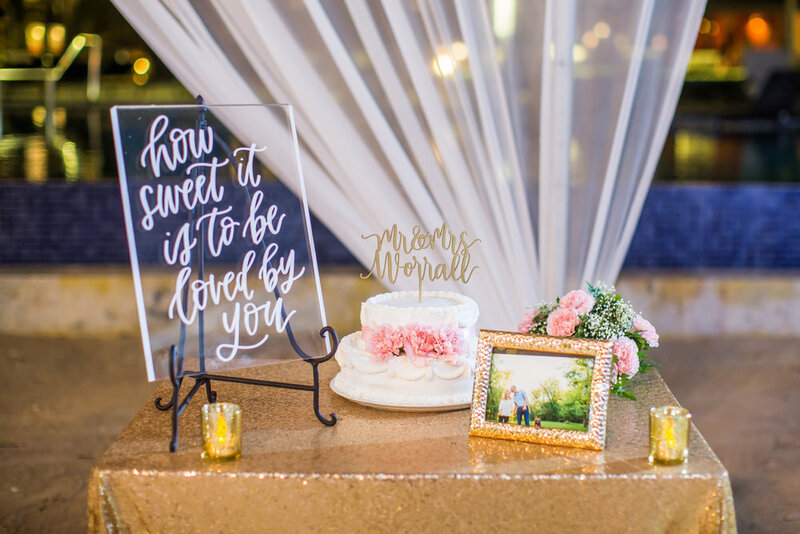 Her cake sign read "How Sweet It Is To Be Loved By You" with white paint on clear acrylic signage. Lastly we did a small sign for their welcome table with their new last names, I love the idea of these signs because they could easily translate to be hung up in your home together after the wedding. WHEW! That was a lot but it all came together SO incredibly perfect. I melted a little bit when Lisha sent me the photos at how beautiful her wedding was! I can't thank Lisha enough for letting me be a part of such a beautiful wedding and being such a dream of a bride to work with! Beautiful Photography thanks to Brittany Morgan Photography. You can see more from their wedding over on her blog right HERE!